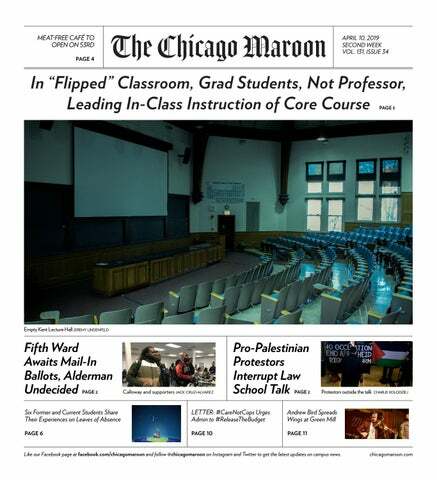 Like our Facebook page at facebook.com/chicagomaroon and follow @chicagomaroon on Instagram and Twitter to get the latest updates on campus news. classes can see what we do,” MacDonald told The Maroon. 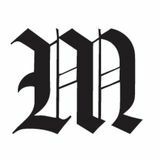 “Whatever the larger-scale political discussion associated with unionization is, I see it as my duty to improve undergraduate education and help graduate students develop, and I’m trying to do that as best as I can,” Abbot said. A Meat-Free Café on 53rd Street? You Better Believe It By CAMILLE KIRSCH News Editor Can’t Believe It’s Not Meat, a vegan café, is the latest addition to Hyde Park’s dining scene. The meat-, egg-, and dairy-free restaurant opened Sunday, April 7.
the block. Most took their meals to go; Can’t Believe It’s Not Meat’s small interior offers limited counter seating and no tables. The interior also features a mirrored brick–accented wall, ring chandeliers, and abstract wallpaper. The cafe is the fifth Hyde Park location from local restauranteur Rico Nance, who also runs Litehouse Grill and Mikkey’s Diner. Can’t Believe It’s Not Meat sits next to Soul Shack, another Nance-owned property, which opened just last month and focuses on meat-heavy soul food dishes. Nance opened Litehouse Grill, his first restaurant, in 2013, and now owns seven Chicago-area dining establishments. He is also a pastor with City of God Christian Ministries. His restaurants are known for serving up healthy options with a side of social justice— Litehouse Grill gives away 20–30 free meals daily to patrons who cannot pay. Can’t Believe It’s Not Meat is located at 1368 1/2 East 53rd Street. The restaurant’s hours are not yet fixed; call (773) 531–2948 to check opening and closing times. Tuesday, April 16th, 4:30-6:30 pm — Classics 110 — Reception to follow This event is recommended for students considering a major in Fundamentals. Persons who may need assistance should contact fundamentals@uchicago.edu. cluding shrimp and grits, duck bacon, biscuits and gravy, and fried chicken. Students can expect the café in Crerar to offer baked goods, coffee, and light lunch offerings, according to a UChicago Dining newsletter. Rome studied culinary arts in Paris and has worked alongside world-famous chefs Wolfgang Puck, Roger Verge, Bobby Flay, and Todd English. Rome returned to Englewood to found Rome’s Joy Catering. Rome is committed to promoting Black participation in the culinary industry, and aims to hire and train people in the culinary arts and hospitality services who may be seen by others as unemployable. Rome partners with numerous programs, including Careers Through Culinary Arts Program, After School Matters, and Healthy Schools Campaign, to increase interest from Black youth in the culinary field. lic transport access to London Heathrow Airport, will expand the University’s presence across Europe, Africa, and the Middle East. The campus will continue to host Booth’s Executive M.B.A. program as well as additional non-degree programming, conferences, and speaker series. The campus will be a sister facility to the Booth School’s Hong Kong location, which opened in December of last year. According to President Robert Zimmer, the new facility reflects Booth’s international approach to business and finance, as well as the University’s mission to increase the number of opportunities for its students across the globe. “Global engagement is fundamental to the University’s ambitious efforts to create new opportunities for research and education, and it is an integral part of Chicago Booth’s distinctive model of business education,” Zimmer said in a press release. Though she felt it was necessary for her to take a leave in order to not burn out academically, Rachel worried about the financial repercussions that would occur if she did so. She contacted her academic adviser, who was part of the Center for College Student Success (CCSS), to try and figure out what would happen to her financial aid package if she took a leave. She expected that someone who was part of the CCSS would know about working with first-generation, low-income students. But that was not the case. “He didn’t know anything and could not direct me anywhere to get information about financial details about taking a leave,” Rachel said. Lee Harris, Editor-in-Chief Elaine Chen, Deputy Editor-in-Chief Deepti Sailappan, Managing Editor Peng-Peng Liu, Chief Production Officer The Maroon Editorial Board consists of the editors-in-chief and editors of The Maroon. ing in truly inclusive structural changes, such as creating cultural centers and a comparative race & ethnic studies department. We call on President Zimmer to #ReleaseTheBudget immediately, and to make good on the University’s promise of honesty and transparency when it comes to policing practices. If you’re interested in getting involved, reach out to us through the UChicago United or Students Working Against Prisons (SWAP) Facebook pages. #CareNotCops is a joint campaign by student groups UChicago United and SWAP that is committed to building alternatives to police and educating the UChicago community about the University’s impact on Hyde Park, Woodlawn, Washington Park, Kenwood, and other surrounding neighborhoods. We advocate for the redirection of University funds from policing to mental health and other services for communities both on and off campus. few days late. Though it might not seem like adding, dropping, or swapping classes and clubs has a real impact on the grand scheme of things, the small steps you take to prioritize yourself (dropping a class, changing your major) actually have a profound impact on your mental health, as well as the trajectory of your interests over your four years of college and beyond. College, especially here at UChicago, is a time for self-transformation—these four years are all about striving to shape yourself into the person you want to be, whoever that is. Don’t feel locked into the organizations you joined and the major classes you took your first year. Ultimately, investing in yourself and in your changing interests will pay off in the long run. Alex Bisnath is a first-year in the College. though I may speak to you in tongues/ we don’t need Rosetta Stone/ to know how this song is sung/ and that what I say is true…./ You can read between the lines/ and you can savor every word.” The audience at the Green Mill did indeed savor every word. Bird’s repertoire reflects a number of traditions—folk, classic rock, jazz, orchestral modernism—but the compelling combination of bleakness and yearning hope that permeates My Finest Work Yet is entirely his own creation. torious in the pole vault and fourth-year Nicole VacaGuzman won the 800-meter. In addition to finishing second overall, the men’s team claimed victories in three different events. The 5000-meter race was the epitome of complete dominance by the Maroons as UChicago claimed the top five spots, with first-year Henry Myers winning first place and bragging rights over his teammates. Additionally, second-year Will Shine was a shining star with his victorious performance in the 3000-meter steeplechase. Alexander Scott won the last victory of the meet for the men’s team in the hammer throw with a whopping throw that went over 50 meters. Both Falkenhayn and third-year Laura Darcey were happy with the promising start and are gearing up for the conference meet that is on the horizon. Darcey said, “The first outdoor meet is always a little difficult, getting used to the outdoor track and competing in a different environment; we had a promising start and we are excited to keep building on these performances in preparation for Conference in a couple of weeks.” Similarly, Falkenhayn proclaimed, “The team is healthy and gearing up for a big push for the conference meet.” Both teams are excited to build upon their amazing indoor performances from the winter. tallied seven hits to one error and moved to 7–10 on the season. The second game saw Kalamazoo take an early lead and make a late push to secure the win, 9-5. The Hornets connected on a sacrifice fly to go up 1–0 in the top of the second inning, but the Maroons responded in the same inning to take a 3–1 lead. Fourthyear first baseman Carly Schulz nabbed an RBI double and second-year Abby Hayes added an RBI single. The Maroons lost the lead in the third inning. First-year pitcher Olivia Dunne struggled to find a tightly-called strike zone, and the Hornets went up 4–3. Kalamazoo kept up their hot offense, though, in the fourth inning after a pitching change for Chicago. Two more runs in the inning extended the Kalamazoo lead to 6–3. Behind a RBI single from first-year Maddy Mudrick and another home run, this time from second-year catcher Gabi Angellotti, the Maroons carved into the score to make it 6–5 entering the sixth inning. The Hornets went up 9–5 in the sixth inning, but in the bottom of the inning, it looked like Chicago would once again lessen the deficit with the bases loaded and fourth-year power hitter Maeve Garvey at the plate. But, a pop-out fly ended the inning without a score. Both teams were shut out in the final inning, and the Maroons lost by the final score of 9–5. On the game, Hayes went 3–4, while Schulz was 2–2 and Angellotti 2–4. Dunne fell to 1–3 on the year, while Regnerus and fourth-year pitcher Jordyne Prussak appeared in relief. The Maroons will look to bounce back with another slate of games this week. The team takes on Finlandia in a home doubleheader on Tuesday, April 9, before travelling to Bloomington, IL over the weekend for the Illinois Wesleyan tournament. The team hopes to improve on its 7–11 record in the final several weeks of the season and, with a streak of wins, could push for postseason competition. STUDENT HEALTH ADVISORY BOARD (SHAB) Do you want an opportunity to influence student health and wellness on campus? Are you interested in working on a team to enhance mental health, physical health and health promotion/ wellness services on campus while alsoproviding feedback on UChicago’s Student Health Insurance Plan (U-SHIP)? This is your opportunity to provide input to members of the senior leadership team of Student Health and Counseling Services. Join the Student Health Advisory Board! We are currently accepting applications for the Student Health Advisory Board for the 2019-2020 academic year. Please click here to apply. You can also find the link on the SHCS website. The deadline to apply is Friday, April 26, 2019 The Student Health Advisory Board is comprised of undergraduate and graduate students, Deans of Students, campus partners, and SHCS Leadership. SHAB members play a key role in collecting student feedback and influencing the ongoing development of SHCS programs and services. Men’s tennis successfully captured a win against the Illinois Institute of Technology last Thursday, besting them in an uncontested match. With their 9–0 victory, the Maroons improved their record for the year to 12–1. For the Illinois Tech Scarlet Hawks, it was prepare for trouble—make it double. The Maroons rocketed to a dominant position early in the afternoon, racking up three early victories across men’s doubles. The duo of fourth-year Max Liu and second-year Jeremy Yuan blasted off at the speed of light, winning their match 8–2. Meanwhile, third-years Eric Kerrigan and Ninan Kumar were clearly prepared to fight, besting their opponents in an 8–4 victory. Finally, the Maroons extended their reach to the stars above once more as the doubles team of first-year Joshua Xu and fourth-year Charlie Pei blasted their opponents off 8–6. The tennis team’s stamina did not abate in singles. First-year Shramay Dhawan and second-year Alejandro Rodriguez proved to be the very best; both were able to defeat their opponents while letting fewer than four points get away. Dhawan managed to secure a 12–2 win across two sets; Rodriguez 12–3 in the same number. The rest of the Maroon’s six-man singles party also performed admirably: Other singles victors include Kerrigan (12–6), Yuan (12–3), Xu (13–9), and first-year Alex Guzhva (12–4). The Maroons continue their quest to become champion across the region this Wednesday, April 10, against Augustana College—who, at 15–4 and 1–0 in their conference play, serve as suitable rivals. Regardless of their opponent’s merits, the Maroon tennis team’s proven strength and undefeated record thus far lend confidence to its quest to catch them all—victories, that is. nal 12 minutes of the first half saw UChicago score four more goals. First-years Anne Sensenig and Abbey Pouba each scored one, and Schulze added another two to the score sheet. At the end of the half, the Maroons held a 7–4 lead. The second half demonstrated how the Belles would not go down without a fight. Constant pressure and attack from St. Mary’s allowed them to score two goals and only have an 8–6 deficit. The Maroons created separation by scoring four straight goals. Despite the back-and-forth exchanges, which led to four more goals scored by the Belles, the Maroons were relentless in maintaining the lead and freezing their opponents out for the remainder of the game. The Maroons outshot their opponents by a 37–27 margin. They capitalized on 15 free position shots and scored five goals off of them. When asked about the team’s performance, Schulze said, “I think our team is in a unique situation as the majority of us are freshmen. Having less experience than other teams based on our age has been a challenge, but so far we have been supportive of each other, which has led to our success. I have been playing lacrosse my entire life and becoming a college athlete brought the intensity of the sport to a new level. I wouldn’t be as successful on the field if it weren’t for the friendships and support of my team. From a leadership standpoint, every player has to step up at some point because our team (including the upperclassmen) is new to college-level lacrosse and we have to set examples for each other. I think working hard in practice sets an example of work ethic, which can then be translated into games.” The UChicago women’s lacrosse team will return to action on April 10, as they take on Augustana College at 7:00 p.m.
12 p.m. 12 p.m. 2 p.m. 10 a.m. 12 p.m. 3 p.m. 7 p.m.